Cost £20. Booking essential as group limited to 40 people. 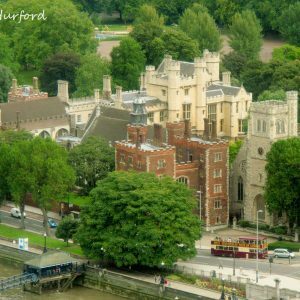 Lambeth Palace has been the London residence of the Archbishop of Canterbury for nearly eight hundred years and remains a working palace. Our visit will include Langton’s Chapel, and below it the Crypt: these form the oldest part of Lambeth Palace today. All of the other buildings that exist within the Palace grounds have been added, expanded and altered over the centuries to suit changes in fashion and purpose. A highlight of our tour will be the Great Hall at Lambeth Palace which currently houses much of the Lambeth Palace Library. It has been re-built many times over the centuries, not least as a result of damage during the English Civil War and the London blitz. Following the Second World War Archbishop Fisher commissioned massive restoration work on the Palace; the Chapel and Lollards Tower were gutted by the direct hit of an incendiary bomb in May 1941. As we will see, the roof and windows were replaced in the Chapel, whilst the ceilings in the Post Room and Lollards Tower were reinforced with brick and timber. Our guided tour will also include an impressive red brick Tudor gatehouse, Moreton’s Tower, complete with a private gaol; the Guard Room named from the time when the Archbishop had his own private militia; Cranmer’s study, associated with the creation of the Book of Common Prayer; and the State apartments. Meet at Lambeth Place gatehouse at 1.45 PM for tour commencing at 2.00 pm. NB: Timing of tour to be confirmed at time of writing.